1740 The English evangelical preacher, George Whitefield, and a group of working class Philadelphians established an educational trust fund for support of a charity school open to both boys and girls. 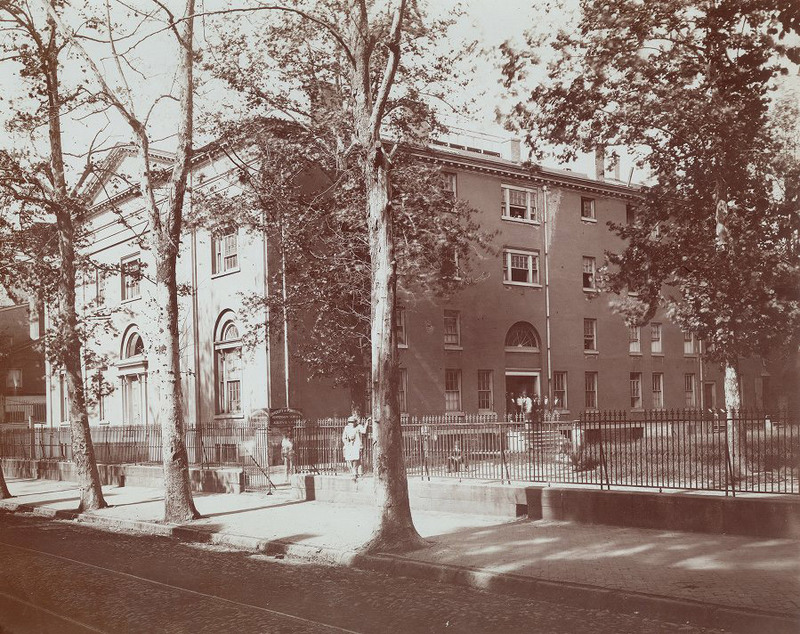 Benjamin Franklin and Penn’s first Trustees took control of the Charity School trust and completed construction of the “New Building” at Fourth and Arch Streets. 1751 The Academy of Philadelphia and the Charity School both opened on the Fourth and Arch Streets campus. The Academy, designed as a college preparatory school, did not admit women. The Charity School, faithful to its 1740 trust, admitted boys in 1751 and made preparations to admit girls. 1755 The College was chartered, but did not admit women. Mary Middleton became Mistress of Girls in the Charity School. Ms. Middleton served the School for just one year, concluding her work in 1762. Sarah Gardiner became Mistress of Girls in the Charity School. Mrs. Gardiner served the School for seventeen years, concluding her work in 1779. The School of Medicine was founded, but did not admit women. The University was chartered by the Revolutionary government of Pennsylvania, but did not admit women. In September, Mrs. John Heffernan became Mistress of Girls in the Charity School. Mrs. Heffernan served the school for three years, concluding her work in July 1782. Mary Robinson came Mistress of Girls in the Charity School. Mrs. Robinson served the School for five years, concluding her work in the summer of 1796. Mary Burke became Mistress of Girls in the Charity School. Ms. Burke served the School for three and one half years, concluding her work in February 1800. Mary Graves became Mistress of Girls in the Charity School. Ms. Graves served the School for fourteen years, concluding her work there in November 1814. The College and School of Medicine moved to a new campus on the west side of Ninth Street, between Market and Chestnut Streets. The Academy and Charity School remained in the old buildings at Fourth and Arch Streets. Jane Knowles became Mistress of Girls in the Charity School. Ms. Knowles made her work at the Charity School her career, serving as the principal teacher until the School was temporarily closed in 1845. The Charity School remained closed for an entire academic year while a new building was constructed. In accordance with the Committee’s report, the Trustees reorganized the Charity Schools of the University and directed that both a Boys’ School and a Girls’ Primary School be re-opened, each with a Principal Teacher and an Assistant Teacher. In September, the Trustees elected Josephine Bedlock to the academic administrator position of Principal Teacher in the Girls’ Charity School. Ms. Bedlock had taught for eight years at the South Eastern Grammar School for Boys in Philadelphia and in the last five of those eight she had served as First Assistant. She enjoyed the unqualified recommendations of its principal and directors. She had also received advanced instruction in teaching at Philadelphia’s Central High School. Ms. Bedlock made her work at the Charity School her career, serving as Principal Teacher until the School closed in 1877. Also in September, the Trustees elected Mary Eliza Pancoast to the academic position of Assistant Teacher in the Girls’ Charity School. Ms. Pancoast had taught for five years in the Philadelphia public schools, the last two of which at Frankford Grammar School. Like Josephine Bedlock, she had received advanced instruction in teaching at Central High School and enjoyed the unqualified recommendation of John S. Hart, Principal of the High School. Mary Eliza Pancoast served as a teacher in the Charity School until 1853. Also in September, the Trustees elected Joseph McKinley to the position of Principal Teacher in the Boys’ Charity School and elected Margaretta Wallace to the position of Assistant Teacher. Ms. Wallace was serving as Principal of the Christ Church Parish School and had previously taught for four years at the Lombard Street (Public) Grammar School. She enjoyed the unqualified recommendations of the principal and the directors of the Lombard Street School. Ms. Wallace, like Josephine Bedlock, made her work at the Charity School her career, serving as a Teacher until the school closed in 1877. The Law School was founded, but did not admit women. The School of Mines, Arts, and Manufactures – predecessor to the School of Engineering and Applied Science – was founded, but did not admit women. Marion Bedlock was named a Teacher of the Female Charity School and thereby joined her older sister Josephine on the faculty of the Charity School. Like her sister, Marion continued on the faculty until the Trustees closed the School in 1877. The Academy was closed and the Charity School alone continued at the old Fourth and Arch Streets campus. The Auxiliary School of Medicine was founded, but did not admit women. The College and the Schools of Medicine, Law, Engineering, and Auxiliary Medicine moved to the new West Philadelphia campus. In July, the Hospital of the University of Pennsylvania opened and admitted its first patients. A Board of Managers of the Hospital had been established in February of that year to supervise the administration of the Hospital. In May, the Board of Managers had appointed a Superintendent, a Matron, and an Apothecary as the senior administrators of the Hospital. Hannah A. Camp (“Mrs. H.A. Camp”) was appointed Matron, with responsibilities for all food service, housekeeping, and nursing services in the Hospital. She was the first woman to hold an administrative position at Penn. She served the University as Matron of the Hospital until 1879, when she submitted her resignation. At the request of the Trustees of the University, the Board of Managers of the Hospital of the University of Pennsylvania established a Board of Women Visitors, the purpose of which was “to assist the Managers in the administration of the housekeeping and nursing of the Hospital.” The first members of the Board of Women Visitors were Anna Blanchard, Mary Todhunter Sill Clark (“Mrs. Clarence H. Clark”), Virginia Earp (“Miss Earp”), Mrs. Ebbs, Mary Klett Gibson (“Mrs. Henry C. Gibson”), Lillie H. Kay, Sarah Longacre Keen (“Mrs. John F. Keen”), Ellen Hansell Page (“Mrs. Joseph Page”), Frances Sergeant Perry Pepper (“Mrs. William Pepper”), Delia Saunders Rogers (“Mrs. Robert Empie Rogers”), Lydia Crane Reyburn (“Mrs. William Stuart Reyburn”), Anna Dike Riddle Scott (“Mrs. Thomas A. Scott”), Ellen Holmes Verner Simpson (“Mrs. Matthew Simpson”), Maria R. Tevis Towne (“Mrs. John Henry Towne”), Anna H. Wilstach (“Mrs. [Wm.] Wilstach”), Annis Lee Furness Wister (“Mrs. Caspar Wister”), and Juliana Wood. In October 1875, the Board of Managers of the Hospital authorized the Board of Women Visitors to adopt by-laws and other rules for their own governance. The Board elected Caroline W. Paul the first President of the Board, Juliana Wood the first Secretary, and Frances Sergeant Perry Pepper the first Treasurer. Through the Board of Women Visitors at the Hospital, women fulfilled the responsibilities of a board of overseers for the first time in Penn’s history. In May, the Trustees elected Hugh Alexander Clarke to the faculty position of Professor of the Science of Music. In October, the Catalogue of the University announced, for the first time, “Lectures on the Science of Music are delivered twice a week by Professor [Hugh A.] Clarke to such persons, members of the University and others, male and female, as may desire systematic instruction on this subject.” It is unfortunate that the University did not register the names of Professor Clarke’s students until the Department of Music was established and opened to enrollment at the beginning of the 1877-78 academic year.